When did Jesus become the Messiah? When Did the Man Jesus Become "The Christ"? I graduated from Bible College in 1969. In the early 1980's I did some personal study of what it meant to be God's anointed, both from an OT and a NT perspective. I became convinced that the term "Christ" had a lot to do with being a King. I bounced my ideas off my former Greek professor (I'm not certain he had that title back then). His reply was fascinating. Essentially his answer was as follows: "No, I don't think it is a good idea to understand the Greek title Christós (5547) (Anointed One) as meaning 'King.' If you do that, you lose the Savior aspect of the title." I didn't say anything, but I didn't agree with him. To me his answer illustrates a fundamental misunderstanding in much of Christendom about the meaning of the title, "Christ." In fact, I suspect many laypeople think, subconsciously, at least, that "Christ" is Jesus' last name. In this article, we want to examine the meaning of the terms "Christ" and "Messiah." We also want to gain a historical understanding of the meaning of the terms. Finally, we want to determine at what point the Man Jesus became the Christ. Or we could ask the question another way. At what point did the Eternal Word of God (John 1:1-3) become "the Christ"? In the first place, let us understand that the Hebrew adjective mâshı̂yach (4899) and the Greek adjectival noun christós (5547) both mean the same thing. They both mean "anointed one." When the terms refer specifically to Jesus of Nazareth, they mean "Anointed One." The adjective mâshı̂yach (4899) "anointed one," or simply "anointed," as developed in the OT, specifically refers to someone who was anointed with olive oil to a special role or ministry. Predominantly, it means "anointed to be king (see, for example 1 Sam. 2:10, 35; 12:3, 5; 16:6; 24:6, 10; 26:9, 11, 16, 23; Psa. 2:2, etc.). But "anointed" also is applied to priests (Lev. 4:3, 5, 16; 6:22), though rarely. The reference to "My anointed ones" in 1 Chronicles 16:22 and Psalm 105:15 probably refers to Abraham, Isaac, and Jacob as God's prophets, as the second line of each verse indicates. (See the context of 1 Chron. 16:15-22 and Ps. 105:8-15.) They were not formally anointed with oil, and there is no record that God anointed them with His Spirit. But they were prophets, for God spoke directly with them, and some times they uttered prophecies (Gen. 12:1-3; 13:14-17; 15:1-21; 17:1-21; 18:1-33; 20:7; 21:12; 22:1-2, 11-12, 15-18; 26:2-5, 24; 27:27-29, 39-40; 28:1-4, 12-17; 31:3; 32:24-32; 35:1, 9-12; 37:5-8, 9-11; 46:1-4; 48:5-6; 49:1-28). There is a related verb, mâshach (4886), which means "to anoint." This verb is used with respect to the anointing of priests, Aaron and his sons (Ex. 28:41; 29:7, 29; 30:30; 40:13, 14-15; Lev. 6:20; 7:36; 8:12; 16:32; Num. 3:3; 35:25). Their anointing served to consecrate them and grant them official status as priests chosen by God. Moreover, on one occasion, the Lord instructed Elijah to anoint Elisha as prophet in his stead (1 Kings 19:16). This meant that Elisha was officially sanctioned by God to carry on the ministry of prophet in Israel after the mysterious departure of Elijah (2 Kings 2:11-12). The Greek verb corresponding to the Hebrew mâshach (4886) is chríō (5548). In all fairness, it is not used a single time in the portions of the Gospel narratives that recount Jesus' immersion by John the Baptist. It is used but five times in the NT. For example, in Luke 4:18-19, Jesus read a portion of Isa. 61:1-2 from the Isaiah scroll which was handed to him (Luke 4:16-17). Applying it to Himself (Luke 4:20-21), he read, in part, "The Spirit of the Lord is upon Me, because He anointed (chríō, 5548) Me to preach the gospel to the poor ..." (Luke 4:18). There Jesus expressly affirms that the Holy Spirit had anointed Him (chríō, 5548). In Acts 4:27, the early church gathered to pray. In so doing they acknowledged that Herod, Pontius Pilate, the Gentiles, and the peoples of Israel had gathered together against God's holy servant Jesus, whom God had anointed (chríō, 5548). In Acts 10:38 Peter informed the expectant Gentiles gathered in Cornelius' home that God had anointed (chríō, 5548) Jesus of Nazareth with the Holy Spirit and with power, and that He had gone about doing good and healing all who were oppressed by the devil since God was with Him. Interestingly enough, the Apostle Paul stated that God has anointed (chríō, 5548) us Christians (2 Cor. 1:21). Finally, the author of Hebrews wrote that God had anointed (chríō, 5548) Jesus, the Messiah, the Son "with the oil of gladness above Your companions" (Heb. 1:8-9). My point is that, even though the verb "anoint" (chríō, 5548) is never used in connection with God's Spirit coming upon Jesus after His baptism, the fact remains that God did anoint Him with His Spirit. The event at which God's Spirit descended from heaven upon Jesus was recorded by all four gospel writers. It happened immediately after His baptism. And in the three Synoptic Gospels, it is recorded that, immediately after the descent of the Spirit, God stated something like, "This is my beloved Son, in whom I am well-pleased" (Matt. 3:16-17; Mark 1:10-11; Luke 3:21-22). In John's Gospel, John the Baptist unequivocally affirmed that he saw the Spirit descending upon and remaining upon Jesus (John 1:32). God had told him that this One would be He who immerses by means of the Holy Spirit (John 1:33). John the Baptist continued, "I myself have seen, and have testified that this is the Son of God" (John 1:34). I believe we can say without reservation that God anointed Jesus with His Spirit immediately after His baptism. And, I conclude, that is the event at which the human Jesus became "the Anointed One," "the Messiah," "the Christ." Saul. Of great interest in this discussion is the historical significance of the verb mâshach (4886) in relation to kings. The narrative begins when God instructed Samuel to anoint (mâshach, 4886) Saul to be King over Israel (1 Sam. 9:16). Samuel did so (1 Sam. 10:1). Of great significance is the fact that Samuel told Saul God would also anoint Saul mightily with His Spirit (1 Sam. 10:6), though the text does not use the word "anoint." Immediately thereafter God changed Saul's heart (1 Sam. 10:9), and it happened just as the prophet Samuel predicted. A group of prophets met Saul, the Spirit of God came mightily upon him, and he prophesied (1 Sam. 10:10). The prophesying was an outward, eventually widespread evidence that God had anointed Saul with His Spirit (1 Sam. 10:12). The Holy Spirit was evident in Saul's demeanor. He came upon Saul mightily (1 Sam. 11:6) when Nahash the Ammonite besieged and threatened Jabesh-Gilead (1 Sam. 11:1-5). Saul led Israel to a decisive victory over the Ammonites (1 Sam. 11:7-11). But Saul acted foolishly. He intruded into the priest's office and offered sacrifices when Samuel delayed (1 Sam. 13:7-13). Consequently, predicted Samuel, Saul's kingdom would not survive. God had chosen for Himself a man after His own heart (1 Sam. 13:14). Saul had constant warfare during his reign (1 Sam. 14:47-52). But Saul's act of disobedience in not destroying every one of the Amalekites and their livestock was the proverbial straw that broke the camel's back (1 Sam. 15:1-9). Yahweh expressed His regret that He had made Saul king (1 Sam. 15:10-11). Samuel's words to Saul must have sounded like a death sentence: "Because you have rejected the word of the LORD, He has also rejected you from being king" (1 Sam. 15:23). God's anointing would head a different direction. David. The LORD rebuked Samuel for his continued grieving over Saul (1 Sam. 16:1). He instructed Samuel to fill his ram's horn with olive oil and proceed to Jesse the Bethlehemite, for God had selected one of his sons to be God's king over Israel (1 Sam. 16:1). Samuel feared Saul's retaliation (1 Sam. 16:2), but God had a plan (1 Sam. 16:2-3). Samuel was to anoint (mâshach, 4886) the one God had chosen (1 Sam. 16:3). The elders of Bethlehem trembled at Samuel's arrival, but he had come in peace. He invited the elders and Jesse and his sons to the sacrifice (1 Sam. 16:4-5). Samuel presumed Eliab, Jesse's oldest son, was God's anointed (mâshı̂yach, 4899) (1 Sam. 16:6), but he was in error. Samuel was not to be impressed either with Eliab's appearance or his height, for Yahweh had rejected him. Man looks at outward appearance, but Yahweh looks at the heart (1 Sam. 16:7). Not one of Jesse's seven sons who appeared before Samuel was God's chosen. They waited until the eighth, the youngest, was called from tending the sheep (1 Sam. 16:8-11). David, like Esau, had a reddish hue to his skin. He had a penetrating gaze, and he was a good-looking young man. Yahweh said, "Arise, anoint (mâshach, 4886) him, for this is he" (1 Sam. 16:12). "Then Samuel took the horn of oil and anointed (mâshach, 4886) him in the midst of his brothers" (1 Sam. 16:13). The effect was immediate – "... and the Spirit of Yahweh came mightily upon David from that day forward" (1 Sam. 16:13, author's translation). The effect upon Saul was also instantaneous and terrifying. "Now the Spirit of the Lord departed from Saul, and an evil spirit from the Lord terrorized him" (1 Sam. 16:14). God had anointed David with His Spirit to be King of Israel; and at the same time He had withdrawn His Spirit from Saul. In effect, Saul was not only "disanointed,"but he was now demonized by an unclean spirit sent by God! Now, in an almost bizarre turn of events, circumstances brought the new Anointed and the Disanointed in close proximity. Because David was an excellent musician, he was brought in to Saul's presence to play the harp whenever Saul was afflicted by the evil spirit from God. Saul loved David, and David became his armor bearer (1 Sam. 16:15-23). A more complex and riveting novel could not have been written! The Holy Spirit's presence and blessing in David's life was immediately evident, even though he had not yet officially become king. Having heard the defiant challenge of the Philistine giant Goliath against the army of Israel (1 Sam. 17:4-11, 23), David was able to persuade King Saul to permit him to fight against him (1 Sam. 17:31-37). His logic was, "Your servant has killed both the lion and the bear; and this uncircumcised Philistine will be like one of them, since he has taunted the armies of the living God" (1 Sam. 17:36). He continued, "The LORD who delivered me from the paw of the lion and from the paw of the bear, He will deliver me from the hand of this Philistine" (1 Sam. 17:37). When reviled by the giant, David boldly predicted that the LORD would deliver Goliath into his hands, and he would kill the giant and behead him, and the dead bodies of the Philistines would become carrion for the vultures and wild animals. The battle was the LORD's (1 Sam. 17:45-47). Moments later he hurled a stone with his sling into the forehead of the giant, stunning him. Using the giant's own sword, he beheaded him (1 Sam. 17:48-51), and Israel's army routed the demoralized Philistine troops (1 Sam. 17:51-53)! Saul was so impressed with David that he appointed David as commander over a thousand troops. Whatever David did prospered (1 Sam. 18:5, 13). But Saul quickly became jealous of David's success, and feared him, because the LORD was with David, but had departed from Saul (1 Sam. 18:12, 14-15). God continued to give David great military success, and protected him from the hand of the jealous and demented Saul (1 Sam. 19:8-10). Thereafter God protected David repeatedly from Saul's murderous pursuit (1 Sam. 20:1-30:31). After Saul's death (1 Sam. 31:1-13; 2 Sam. 1:1-27), David was successively anointed as King over Judah (2 Sam. 2:1-4), and finally over all Israel (2 Sam. 5:1-5). [Note that the word "anointed" (mâshach, 4886) is used of the men of Judah anointing David as King over Judah in 2 Sam. 2:4; and that the verb is used of all the elders of Israel anointing David as king over Israel in 2 Sam. 5:3; 1 Chron. 11:3.] David's success as God's anointed continued. He quickly conquered the Jebusites and captured the stronghold of Zion (2 Sam. 5:6-9). He became greater and greater because Yahweh, God of Troops was with him (2 Sam. 5:10). God granted David many military victories (2 Sam. 5:17-25; 8:1-14). Yahweh helped David wherever he went (2 Sam. 8:14). David, as is true of each of us, was not a perfect man. His terrible sin of adultery with Bathsheba and his subsequent murder of her husband cost him much discord and misery in his own life and the life of his family (2 Sam. 11:1 - 20:23). David was fearful that his sin would cost him God's anointing, as had happened to Saul. David's prayer in Psalm 51:11 should be interpreted in this regard. David was requesting that God not remove him from being king. But God had made an eternal covenant with David, as we will discuss next. Especially noteworthy is God's response to David's desire (2 Sam. 7:1-2) to build a permanent "house" (temple) in which God would condescend to dwell among His chosen people. God would instead build a house for David (2 Sam. 7:11). Instead, David's seed (2 Sam. 7:12) would build a house for Yahweh's name, and Yahweh would establish the throne of his kingdom forever (2 Sam. 7:13). Yahweh would be a father to him, and he would be a son to Yahweh (2 Sam. 7:14). Yahweh would correct him and not remove His loyal love (chesed, 2617) from him as he had taken it away from Saul and had removed from king before David (2 Sam. 7:15). Moreover, David's house and kingdom would endure before Yahweh forever, and his throne would be established forever (2 Sam. 7:16). This critical promise was later termed a covenant (Psalm 89:3-4, 27-29, 34-37). We know it as the Davidic Covenant, which has enormous implications for Jesus as the ultimate Anointed One, the ultimate seed of David. Gabriel's appearance to the virgin Mary is of critical importance in this whole discussion. Just as Yahweh had promised David an eternal house, an eternal kingdom, and an eternal throne (2 Sam. 7:16), the messenger Gabriel used identical terminology with Mary, albeit recorded for us in a different language. Gabriel predicted to this virgin that she would conceive in her womb and bear a son, whom she was to name "Jesus" (which means "Yahweh is Salvation") (Luke 1:26-31). Her son would be great, and would be called "Son of the Most High" (Luke 1:32). Moreover, the Lord would give him the throne of his father David (Luke 1:32); he would reign over the house of Jacob forever; and his kingdom would have no end (Luke 1:33). Without a doubt, Jesus is the ultimate fulfillment of the Davidic Covenant. He is the seed of David who will eventually sit on David's throne, reign over the nation of Israel, and establish an eternal kingdom that will, according to OT prophecies, extend over the entire globe (Zech. 14:9; Psa. 2:1-9; 22:27-31; Isa. 2:1-4; 11:1-10; 45:22-25; 49:5-7; 59:15-21; 60:1-3, 10-12, 14-16; 66:10-16, 18-24; Hab. 2:14). Now let us move to that critical question: When did the man Jesus become the Anointed One? When did Jesus become the Messiah? When did Jesus become the Christ? At the outset of this phase of the discussion, let us acknowledge that we are not questioning the Eternal Deity of the God-Man, Jesus. But we are stating that we was not born as the Anointed One. Without a doubt, He was conceived by the power of the Spirit (Luke 1:35). But there is no record in his early life that God anointed Jesus with His Spirit to be Prophet, Priest, and King prior to His having been baptized by John the Baptist. We have a record that God anointed Saul with His Spirit after Samuel had anointed him with olive oil. We have a record that God anointed David with His Spirit immediately after Samuel had anointed him with olive oil. We have no record of any Israeli officials ever anointing Jesus with olive oil to be King. If there is any record of Jesus having been anointed by any human at all, it was when a woman anointed Jesus with costly perfume (Mark 14:3). Jesus said she had anointed His body beforehand for burial (Mark 14:8). (See also Matt. 26:6-13; John 12:1-8). But we do have a record of God's having anointed Jesus with the Holy Spirit. This fact is recorded in each of the gospels. John the Immerser (or Dipper, if you prefer, translating baptistês, 910) came preaching, "Change your mind, for the kingdom of the heavens has drawn near" (Matt. 3:2, author's translation). John continued, "I, indeed, immerse (baptídzō, 907) you by means of water in view of change of mind, but there is one coming after me who is mightier than I, of whom I am not qualified to remove his sandals. He himself will immerse (baptídzō, 907) you by means of the Holy Spirit and fire" (Matt. 3:11, author's translation). John continued, "... whose winnowing fork is in his hand; and he will thoroughly clean his threshing floor, and he will gather his wheat into the granary, but the chaff he will burn with fire inextinguishable" (Matt. 3:12, author's translation). John the Immerser clearly understood that the one mightier than he would immerse by means of superior agents, Spirit and fire, in contrast with his inferior agent, water. It stands to reason that the Messiah, once he had been anointed by God with the Holy Spirit, would be able to immerse by means of the Spirit. His complete immersion by means of fire is yet in the future. Jesus came to the Jordan to be immersed (baptídzō, 907) by John (Matt. 3:13-15). 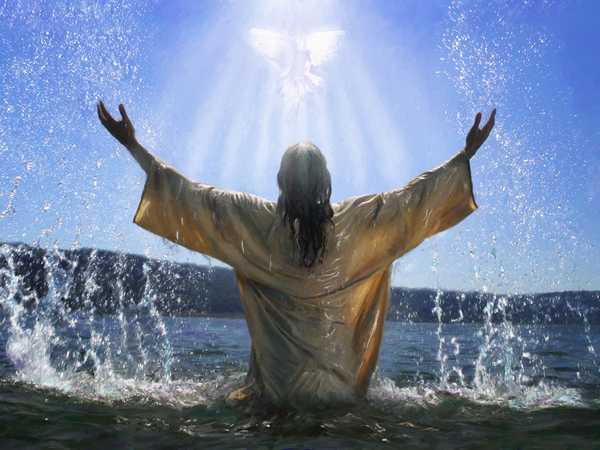 Having been immersed (baptídzō, 907), Jesus immediately ascended from the water, the heavens were opened, and Jesus saw the Spirit of God descending in the form of a dove and alighting on himself. And observe, a voice out of the heavens pronouncing, "This is My Beloved Son, in whom I am well pleased" (Matt. 3:16-17). This, I maintain, is the moment in time at which God anointed Jesus with His Spirit to be King of Israel. To be sure, that anointing also included his assignment to be Prophet, and Priest. But the primary significance of anointing, both in the OT and here, is anointing to be King. It is at this point that the God-Man Jesus became God's Anointed One. He became God's Messiah. He became, in Greek terms, ho Christòs (5547), "the Christ." In English terms, he became God's Christ. Or in translated terms, He became God's Supreme Anointed One - anointed to be Prophet, Priest, and King. It is no accident that God pronounced Jesus as His "beloved Son" in connection with His anointing him with His Spirit. After all, about a millennium earlier, God had predicted to David that He would maintain a "Father - son" relationship with David's seed (2 Sam. 7:12-14). Though that promise was made initially regarding David's son Solomon, it cannot be denied that the whole passage of 2 Sam. 7:11-16 has overtones that ultimately can be fulfilled only in Jesus, the Supremely Anointed Son of David (Matt. 1:1). How else could David's "house" and "kingdom" and "throne" be established forever (2 Sam. 7:13, 16)? It is also worth noting that the very next verse after God's having anointed Jesus with His Spirit to be King and identifying Jesus as His beloved Son, the record commences of Jesus having been led by the Spirit into the wilderness to be tempted by the devil (Matt. 4:1-11). Jesus has now become the Messiah, God's designate for King of Israel. It is imperative that he be immediately led by the Spirit to an abandoned place there to be tempted by the devil in order to demonstrate He was perfect, and could not sin. Thus, he was qualified to serve as the Messiah. After Jesus' forty-day fast (Matt. 4:2) the devil's temptation was fascinating. "If (literally, "since") you are the Son of God, command that these stones become bread" (Matt. 4:3). What Satan was saying was this: "Since you are the Davidic Messiah, and thus have a Father-Son relationship with God (2 Sam. 7:14), you have authority. Satisfy your hunger by commanding these stones to become bread." Satan's second temptation also assumed Jesus was the Messiah: "Since you are the Son of God (i.e., the Davidic Messiah, 2 Sam. 7:14), throw yourself down from the pinnacle of the temple because God has promised to protect you" (Matt. 4:5-6, quoting Psalm 91:11-12) (author's paraphrase). In the devil's third temptation of the Messiah he showed Jesus all the kingdoms of the world and promised to give them to Jesus if He would worship him (Matt. 4:8-9). The devil was shrewd. He knew that the promise made in Scripture to the Messiah as the Davidic Son of God was that He would rule over all the nations with a rod of iron (Psalm 2:7-9). Jesus, the Messiah, knew, however, that was not God's plan. His sacrifice for sin, the coming Church Age, and the Tribulation would all take place before His rule upon earth. He resisted all three Messianic temptations, presumably by the power of the Spirit, the One who had led Him into the wilderness to be tempted by the devil (Matt. 4:1). Compared to Matthew' record of Jesus' anointing, Mark's record is truncated. He writes that Jesus came from Nazareth in Galilee and was immersed (baptídzō, 907) by John in the Jordan (Mark 1:9). Immediately upon ascending from the water he saw the heavens being split apart, and the Spirit as a dove descending upon him (Mark 1:10). And there came to be a voice from the heavens, "You are My beloved Son; in you I take great pleasure" (Mark 1:11). And immediately the Spirit expelled him into the wilderness (Mark 1:12). And he was in the wilderness forty days being tempted by Satan, and he was with the wild animals, and the messengers were serving him (Mark 1:13). Moreover, after John had been arrested, Jesus came into Galilee proclaiming the good news of God (Mark 1:14), and saying, "Has been fulfilled - the time; and has drawn near - the kingdom of God. Be changing your minds, and be believing in the good news!" (Mark 1:15, author's literal translation). Several observations are in order: (1) Mark begins his record, "The beginning of the gospel of Jesus Christ, the Son of God" (Mark 1:1). Matthew has no such opening in Matthew 3. However, Matthew begins his gospel in this manner, "The record of the genealogy of Jesus the Messiah, the son of David, the son of Abraham" (Matt. 1:1). (2) Mark has no genealogy, as does Matthew (Matt. 1:1-17), no record of the virgin Birth of Christ (cf. Matt. 1:18-25); no record of the visit of the magi (cf. Matt. 2:1-12); no record of the flight of Jesus to Egypt (cf. Matt. 2:13-18); and no record of the return from Egypt (cf. Matt. 2:19-23). (3) Mark records no announcement by John about the kingdom of the heavens having drawn near (Mark 1:1-8; cf. Matt. 3:1-2). (4) Mark records no scathing comments by John directed at the Pharisees and Sadducees (Mark 1:4-8; cf. Matt. 3:7-10). (5) Both record John the Immerser's prediction that the mightier one coming would baptize by means of the Spirit (Matt. 3:11; Mark 1:8). Mark omits that the mightier one would baptize by means of fire (Matt. 3:11-12; Mark 1:8). (6) Both record the descent of the Spirit upon Jesus (Matt. 3:16; Mark 1:10). (7) Both record God's voice of approval, "You are My beloved Son, in you I am well-pleased" (Matt. 3:17; Mark 1:11). (8) Both record Jesus' Spirit-directed temptation by the devil (Matt. 4:1-11; Mark 1:12-13). (9) Both record a similar announcement by Jesus concerning the good news of God (Mark 1:14), "Has been fulfilled - the time, and has drawn near - the kingdom of God; be changing your minds and be believing in the good news!" (author's literal translation of Mark 1:15; cf. Matt. 4:17). (10) In summary: Both gospels record God's anointing of Jesus with His Spirit; and both gospels associate God's pronouncement of Jesus' being His beloved Son. Both of these, I maintain, have to do with His being the Messiah, the Anointed One. And this official anointing occurred immediately after His baptism. In regard to the ministry of John, Luke recorded that the word of God came to John, son of Zacharias in the wilderness (Luke 3:2). He came into all the region bordering the Jordan River announcing an immersion of change of mind with a view to forgiveness of sins (Luke 3:3). Luke, the historian, believed the ministry of John was a fulfillment of the prophecy of Isaiah the prophet recorded in Isaiah 40:3-5 (Luke 3:4-6). John warned the crowd not merely to go through the motions of a professed change of mind, but to perform appropriate deeds. Otherwise they were in danger of fiery judgment (Luke 3:7-9). When pressed, he gave them examples of responses appropriate to a change of mind (Luke 3:10-14). The people were wondering whether or not John were the Christ (Luke 3:15). John responded, "I indeed immerse you with water. But there is one coming who is stronger than I, of whom I am not worthy to unloose the strap of his sandals. He will immerse you with the Holy Spirit and fire, whose winnowing fork is in his hand to thoroughly clean his threshing floor and gather his wheat into his granary, but the chaff he will burn with inextinguishable fire" (Luke 3:16-17, author's translation). John's fearless exhortations of the people as he announced to them the good news eventually got him in trouble with Herod the tetrarch. John found himself imprisoned (Luke 3:18-20). But prior to John's imprisonment, when all the people came to be immersed, Jesus also, having been immersed, and praying, the heaven was opened, and the Holy Spirit descended upon him in bodily form as a dove, and there came a voice from heaven, "You are My beloved son. In you I am well pleased" (Luke 3:21-22). So, just as do Matthew and Mark, Luke recorded God's anointing of Jesus with His Spirit as the Messianic Prophet, Priest, and King. And in keeping with God's promise to maintain a Father-Son relationship with the seed of David (2 Sam. 7:12, 14), God announced a Father-Son relationship with Jesus, descendant of David (cf. Luke 1:32-33; 3:21-22). Jesus was now anointed with God's Spirit to be the Messiah, the Christ. He was anointed to be Israel's greatest King, Israel's greatest Prophet, and Israel's greatest Priest. In each of these offices He would have a world-wide, transnational impact. Luke then proceeded to give Jesus' legal genealogy, tracing it backwards all the way to Adam, the son of God (Luke 3:23-38). This underscores the universality of Jesus' offices of Prophet, Priest, and King. In Luke 4:1-13 Luke records the temptation of Jesus. The opening two verses are instructive, highlighting the purposeful activity of the Holy Spirit in the ministry of the newly-Anointed Messiah: "Jesus, full of the Holy Spirit, returned from the Jordan and was led around by the Spirit in the wilderness for forty days, being tempted by the devil..." (Luke 4:1-2a). Luke 4:14-15 is equally instructive. "Jesus returned to Galilee in the power of the Spirit, and news about Him spread through all the surrounding district. And He began teaching in their synagogues and was praised by all." The point I am making is that Jesus, having been anointed by the Spirit, is now the Messiah, the Christ. It is no surprise that everything He does now is guided by the Holy Spirit, and He is full of the Spirit. Perhaps nowhere in Luke is Jesus' self-awareness of His own Messianic role more clearly stated than in the incident recorded in Luke 4:16-21, a passage that illustrates his "teaching in their synagogues" (Luke 4:15). Jesus entered His home-town synagogue on the Sabbath and stood up to read (Luke 4:16). Providentially, he was handed the Isaiah scroll (Luke 4:17). He deliberately turned to Isaiah 61:1-2, and read from it, carefully terminating the reading prematurely in Isa. 61:2 (Luke 4:18-19). He handed the scroll back to the attendant and sat down, assuming the posture of a rabbi (Luke 4:20). Then he said with supreme confidence, "Today this Scripture has been fulfilled in your hearing" (Luke 4:21). He stopped reading right before the clause, "And [to proclaim] the day of vengeance of our God" (Isa. 61:2), because that would not be fulfilled until events surrounding his Second Coming. The vocabulary reading of the passage Jesus read is worth noting, in both Hebrew and Greek. First, he read, "The Spirit of the Lord is upon me" (Luke 4:18; Isa. 61:1). In the NT, the noun "Spirit" is pneûma (4151); in the OT, it is rûach (7307) . Then he read, "...because He anointed Me..." (Luke 4:18; Isa. 61:1). In the NT, the verb "He anointed" is the verb chríō (5548), whose corresponding noun is Christós (5547); in the OT "anointed" is the verb mâshach (4886), whose corresponding adjectival noun is mâshı̂yach (4899). This simply confirms what I have already stated. Jesus became the Messiah at the point at which He had been anointed with the Holy Spirit at his baptism (Luke 3:21-22). And Jesus was fully aware of that fact. John the Apostle has a remarkable quality of using simple language that is beyond profound. He alone of all the Gospel writers describes Jesus in his pre-incarnate existence. In light of our present discussion, John nowhere intimates that Jesus was eternally the Messiah, or Christ. Rather, in his pre-incarnate position, John describes him as the Word (lógos, 3056) of God. To me this means that Jesus is the ultimate expression of Who God Is. From John we learn that the Word was existing (Imperfect tense) in the beginning (John 1:1). This means that the Word is eternal. He was always existing in the dateless past. John states also that the Word was being (Imperfect tense) with God (John 1:1). This prepositional phrase indicates both close proximity, but also distinction. He was in close proximity to God, but yet there were two distinct persons. In the third statement of this first verse, John records that the Word was always being (Imperfect tense) God (John 1:1). This indicates identity. Not identity of persons, but identity of being and essence. Though He was a person to be distinguished from God, His essence was identical to that of God. He was just as much "God" as God Himself has always been. In other words, the pre-incarnate Word was just as infinite, as immutable, as eternal, as omniscient, as omnipresent, as omnipotent, as sovereign, as holy, as just, as loving, and as true as is God Himself. None of that changed when He became man. But in becoming a human being, He voluntary assumed certain limitations that a physical body necessarily conveyed. The most obvious example is that, as the Word of God, He could not possibly die. As human, he could, and He did. But not only did He become human, He, by the will of God, and in God's time, became a very specialized human being -- the Ultimate Anointed One. That role had special privileges, but also special obligations, ones that no other human ever had before, or could have. More about that later. As if to pound home a point, John incorporates into one statement the first and third clauses of the first verse. He states, "This One (i.e. the Word) was being (Imperfect tense) in (the) beginning with the God" (John 1:2, author's literal translation). Demonstrating the eternality and the sovereign omnipotence of the Word, John adds, in John 1:3, "All things through Him (i.e. the Word) came into being (Aorist tense - at a point in time); and apart from Him nothing, not one thing, came into being (Aorist tense - at a point in time) which has come into being" (Perfect tense) (author's literal translation). John described the Word as the source of life and light (John 1:4). Unfortunately, most people live in the darkness and did not comprehend the light (John 1:5). There was one who did, however. His name was also John (John the Baptist or John the Immerser) (John 1:6). He came to testify about the Light so that all might believe (John 1:7-8). The word "believe" (pisteúō, 4100) is a favorite theme of John's. He uses it 98 times in his gospel, and it appears in his "purpose" statement (John 20:30-31). The Word was the true Light who offers salvation to every person (John 1:9). Though He made the world, the world did not know Him (John 1:10). He came to His own things, which He had created, but His own people did not receive Him (John 1:11). But to as many as did receive Him, to the ones believing in His name, He gave authority to become (Aorist tense - at a point in time) children of God (John 1:12). These were born (or more precisely, begotten) (Aorist tense - at a point in time) not of bloods (human DNA? ), nor of the will of flesh (human procreation), nor of the will of a male (husband), but of God (John 1:13). John (the Apostle) continued, "And the Word became flesh and tented among us, and we gazed upon His glory, glory as of One uniquely begotten from the Father, full of grace and truth" (John 1:14). John (the Baptist) testified about the Word and His higher rank (John 1:15-16). "For the Law was given through Moses; grace and truth were realized through Jesus Christ" (John 1:17). "No one has seen God at any time. But uniquely begotten God, the One being in the bosom of the Father, that One has exegeted (or explained) Him" (John 1:18, author's translation). Having, for the first time, used Jesus' given name and his formal title, "Christ" (John 1:17), John the Apostle endeavors to relate the testimony of John the Baptist about Jesus the Christ (John 1:19-24). Priests and Levites apparently asked him if he were the Messiah (John 1:19). He replied, "I am not the Christ" (John 1:20). Nor was he Elijah or "the Prophet" (John 1:21). He did admit to being "a voice of one crying in the wilderness, 'Make straight the way of the Lord,' as Isaiah the prophet said" (John 1:23, quoting Isa. 40:3). This is a fact that all four gospel writers incorporate into their narratives (Matt. 3:3; Mark 1:3; Luke 3:4; John 1:23). When prodded by the Pharisees as to why he was immersing if he were neither the Christ, nor Elijah, nor the Prophet (John 1:24-25), John replied, "I am, indeed, immersing in water, but among you stands one whom you do not know," (John 1:26, author's translation), the One after me coming, of whom I am not worthy to loosen the strap of his sandal" (John 1:27, author's translation). The next day John saw Jesus coming to him and he said, "Look! the Lamb of God, the one removing the sin of the world" (John 1:29, author's translation). He continued, "This is the one on behalf of whom I said, 'After me is coming a man who has come into existence before me, because before me He was being' (Imperfect tense) (John 1:30, author's translation). John continued, "And I had not known Him, but in order that He might be revealed to Israel, on this account I came, even I, immersing in water" (John 1:31, author's translation). And John testified, saying, "I have seen the Spirit descending as a dove from heaven and remain upon Him. And I did not know Him, but the One having sent me to immerse in water -- that One said to me, 'Upon whomever you see the Spirit descending and remaining upon him, this one is the one immersing by means of the Holy Spirit'" (John 1:32-33, author's translation). "And I myself have seen, and I have testified that this one is the Son of God" (John 1:34, author's translation). Again, the next day John was standing with two of his disciples, and having seen Jesus walking around, he said, "Look! The lamb of God!" (John 1:35-36, author's translation). Here are some deductions which can be made with regard to the Apostle John's record of the Baptism and Anointing of Jesus. (1) The Apostle John does not use the term "Christ" to refer to Jesus' pre-incarnate existence. Rather, he uses the term "Word" (lógos, 3056) four times -- three times in John 1:1, and once in John 1:14. (2) The first time the Apostle John uses the name and title "Jesus Christ" (Christós, 5547) is in John 1:17. This is in the context of John the Baptist's testimony about Jesus, referred to in John 1:15, and continued in much more detail in John 1:19-34. (3) My conclusion therefore is that John the Apostle's terminology is consistent with the view that the human Jesus, while always being Deity as well as man, did not become "the Christ" ("the Anointed One") until after God anointed Him with His Spirit immediately after His baptism. One objection that has been mounted against this view is the significance of the announcement by an angel of the Lord to frightened shepherds as recorded in Luke 2:8-12. In particular, the angel announced, "for today in the city of David there has been born for you a Savior, who is Christ the Lord" (Luke 2:11). This text has been offered as proof that Jesus became the Christ at His birth. Here is my response to that objection. First, there is no record that Jesus was anointed by the Spirit at His birth. I can find it nowhere. By contrast, the angel Gabriel specifically predicted to Zacharias that his son "will be filled with the Holy Spirit while yet in his mother's womb" (Luke 1:15). No such similar announcement is made about Mary's son, Jesus. Gabriel did tell her, “The Holy Spirit will come upon you, and the power of the Most High will overshadow you; and for that reason the holy Child shall be called the Son of God" (Luke 1:35). However nothing is predicted about the action of the Holy Spirit upon Jesus until immediately after His immersion (Luke 3:21-22). We are told that Elizabeth was filled with the Holy Spirit (Luke 1:41). We are told that Zacharias was filled with the Holy Spirit (Luke 1:67). We are told that, at Jesus' presentation to the Lord at the temple, a devout man named Simeon "came in the Spirit into the temple (Luke 2:26-27) and uttered prophetic words (Luke 2:28-35). We are told that "the Child continued to grow and become strong, increasing in wisdom; and the grace of God was upon Him" (Luke 2:40). Luke records Jesus' visit to the temple at the age of twelve years (Luke 2:41-51). But no reference to the Holy Spirit is made. The concluding statement is, "And Jesus kept increasing in wisdom and stature, and in favor with God and men" (Luke 2:52). But nothing is mentioned about the Holy Spirit in connection with Jesus. In fact, not one word is stated about the Holy Spirit in relation to Jesus until John the Immerser prophesied about Jesus, "He will immerse you with the Holy Spirit and fire" (Luke 3:16). Thereafter, it was not until Jesus had been immersed by John in water, and was praying, that heaven opened, and the Holy Spirit descended upon Him in bodily form like a dove, and a voice came out of heaven, "You are My beloved Son, in You I am well-pleased" (Luke 3:21-22). That, I believe, is the moment at which God officially anointed Jesus to be Prophet, Priest after the order of Melchizedek, and Davidic King. So what about the announcement of the angel in Luke 2:11? It appears more likely that the announcement of the angel to the shepherds was an announcement of the destiny of this infant. It was an announcement of the role or office this child would fulfill. He certainly was a descendant of David as an infant. But in my understanding, he had not yet been anointed with the Spirit by God to be prophet, priest, and king. I believe all would agree that He was not yet a Savior. He was destined to become each of those, in God's time. By the term "Christ" the shepherds would have understood "Anointed to be King." By the term "Savior," they would have understood a political Savior of the nation of Israel (see Luke 1:67-75; 24:13-21). But Zacharias, the father of John the Immerser, also would have understood the need for spiritual salvation for Israel (Luke 1:74-79). If my view is correct (and I think it is), Jesus did not become the Messiah until 30 years after His birth. And He did not begin his ministry until after the descent of the Holy Spirit after His baptism. If Jesus were already anointed by God with His Spirit at birth, why is no ministry recorded prior to His baptism and subsequent anointing? Furthermore, Jesus did not become a spiritual Savior until He died, 33 years after His birth. He still has not become a Political Savior of the Nation of Israel, 2000 years later. So it makes sense to me to understand the announcement of the angel as meaning that this child was destined to become "a Savior, who is Christ the Lord" (Luke 2:11).